I love reading books that make you think about what you really want out of life and give you the tools to develop a plan that will allow you to reach your goals. This book is no different. 48 Days To The Work You Love shows you how to take a deep dive and identify your (1) Skills and Abilities, (2) Personality Tendencies, and (3) Values, Dreams and Passions. Believing that I have been created with a purpose, I commit the next 48 Days to a new clarity and a plan of action for finding—or creating—work that is meaningful, fulfilling and profitable. The next asks the question “What is Work?” How would Lebron James answer this question? A food server? An executive? A small business owner? Why shouldn’t work be something that you look forward to each day? A “job” or an “income” should not define you. The second section focuses on how we choose work. It used to be that individuals would head off to college after graduation so that you can make yourself marketable to employers. And don’t get me wrong, if you have a passion for a career that takes a degree, a college education will be on your list of steps to reach your goal. But maybe you have no desire to be part of a “traditional” career plan. It is no secret that college educations are expensive and they are not for everyone. Trade schools can teach a person a skill that can provide them with an income and may give them the opportunity to own their own business and provide a service to others. This book also talks about how the days of having a job for 40 years with the same company and retiring with a pension are gone. More and more people are opting to keep a job 5 years less and then move on to what the next chapter in their life may bring. So, a big part of the book focuses on creating a resume that sticks out, how to master an interview and the best method for locating a traditional job. There is information in this book about how to stay positive if you are unemployed and looking for a job. Additionally, how to take steps to move away from work that is not suited for your personality and on to something you will truly enjoy. Do you like what you do to make a living? Even if you love it, 48 Days To The Work You Love is still a great read. This book and its associated website gives you the tools to figure out what it is that you really would enjoy and how to make a plan to go about achieving it. I leave you with the below quote and hope that you truly find the work that you love. “Why is it the only a minority of our population love their work? If you are creative enough to select the ideal vocation, you can win, win big time. The really brilliant millionaires are those who selected a vocation that they love—one that has few competitors but generates high profits.” –Thomas Stanley, in The Millionaire Mind. 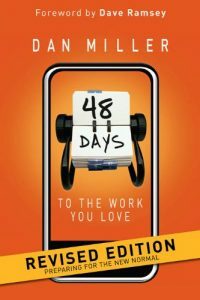 Want to read 48 Days To The Work You Love…CLICK HERE!